If you’re always using a camera of some sort, be it a big DSLR, a camcorder, or some sort of compact handheld camera at times you need a mount. There are numerous camera mounts on the market and Satechi has a new one called the SCH-22 Camera Holder & Mount for DSLR and point-and-shoot cameras. The mount sells for $27.99. 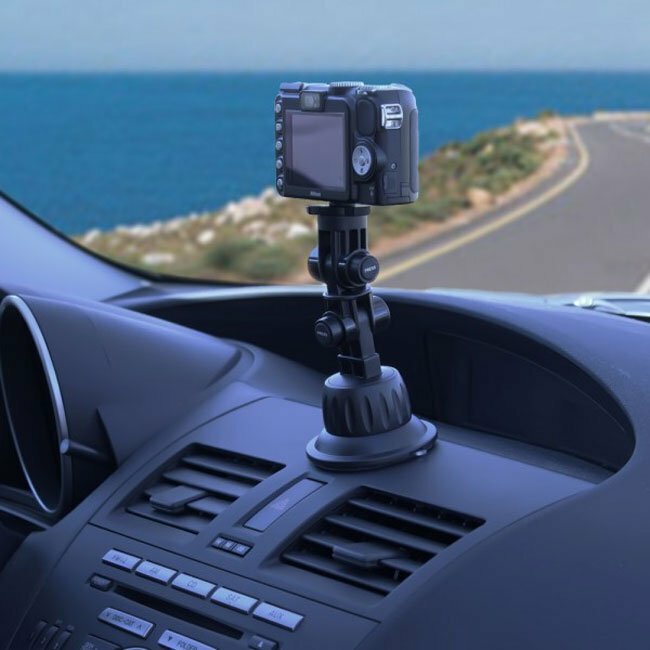 The camera mount will support small cameras, camcorders, and heavy DSLR’s with a suction cup that’s powerful enough to mount them on smooth vertical surfaces or the dash of a car. The mount is adjustable for angle and has an adhesive smart pad for stronger mounting on flat surfaces. The mount allows the camera rotate 360° and has a pair of 180° swivel hinges for adjustability. Honestly, I worry about mounting an expensive camera on vertical surface using an adhesive disk. It would be cool if this thing can hold a camcorder on the dash of a car allowing for in car video.